The renowned linguist and controversial political critic said President Donald Trump is choosing to race toward the catastrophes of climate change. Chomsky said climate change and nuclear war are the two main existential threats facing humanity. The Republican Party and Trump are not only failing to address climate change, but also are choosing to make it worse, according to Chomsky. Polling data show that American Republicans seem to be growing slightly more skeptical about climate change and climate science. In 2016, renowned linguist and political critic famously said the modern Republican Party is "the most dangerous organization" in human history. His argument, which he later outlined in a New York Times opinion piece, was that President Donald Trump and his Republican allies are not only failing to address climate change—the principal existential threat facing humanity, in addition to nuclear war, according to Chomsky—but are also choosing to race toward catastrophe as quickly as possible, in the interest of short-term profits. Chomsky elaborated on these concerns in a recent interview with Scientific American. For example, the controversial critic told science writer John Horgan that a September 2018 report from Trump's National Highway Traffic Safety Administration qualifies as "a contender for the most evil document in history." That report predicted the planet would warm by 7 degrees Fahrenheit by the end of the century—a catastrophic forecast by any standard—but also said the administration isn't planning to do anything about it. "It presented a rational argument: extrapolating current trends, by the end of the century we'll be over the cliff and automotive emissions don't contribute very much to the catastrophe – the assumption being that everyone is as criminally insane as we are and won't try to avoid the crisis," Chomsky said. "In brief, let's rob while the planet burns, putting poor Nero in the shadows." Chomsky said the administration's pursuit of money over stability makes it superlatively malicious. "There have been many monsters in the past, but it would be hard to find one who was dedicated to undermining the prospects for organized human society, not in the distant future -- in order to put a few more dollars in overstuffed pockets." Chomsky argued that other institutions share a responsibility to mitigate or address climate change. "The same can be said about the major banks that are increasing investments in fossil fuels, knowing very well what they are doing. Or, for that matter, the regular articles in the major media and business press reporting US success in rapidly increasing oil and gas production, with commentary on energy independence, sometimes local environmental effects, but regularly without a phrase on the impact on global warming – a truly existential threat. Same in the election campaign. Not a word about the issue that is merely the most crucial one in human history." Does society need reform or revolution? Asked about the utility of incremental change versus more drastic measures, Chomsky said both are useful in particular contexts. "Generalizations are misleading; too much depends on specific circumstances. But some have a fair degree of validity, I think," Chomsky said. "One is that there is both justification and pressing need for radical changes in the socioeconomic and political orders. We cannot know to what extent they can be achieved by incremental reforms, which are to be valued on their own. 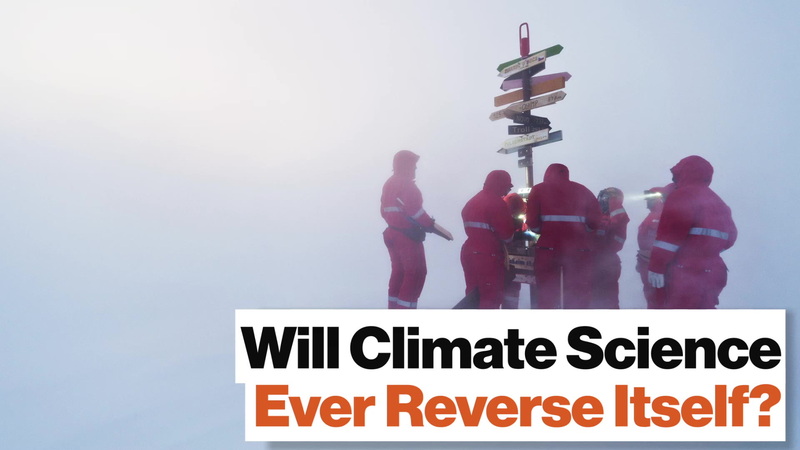 But unless the great mass of the population comes to believe that needed change cannot be implemented within the existing system, resort to "drastic measures" is likely to be a recipe for disaster." A 2018 Gallup poll shows how Democrats and Republicans are sharply divided on climate change. 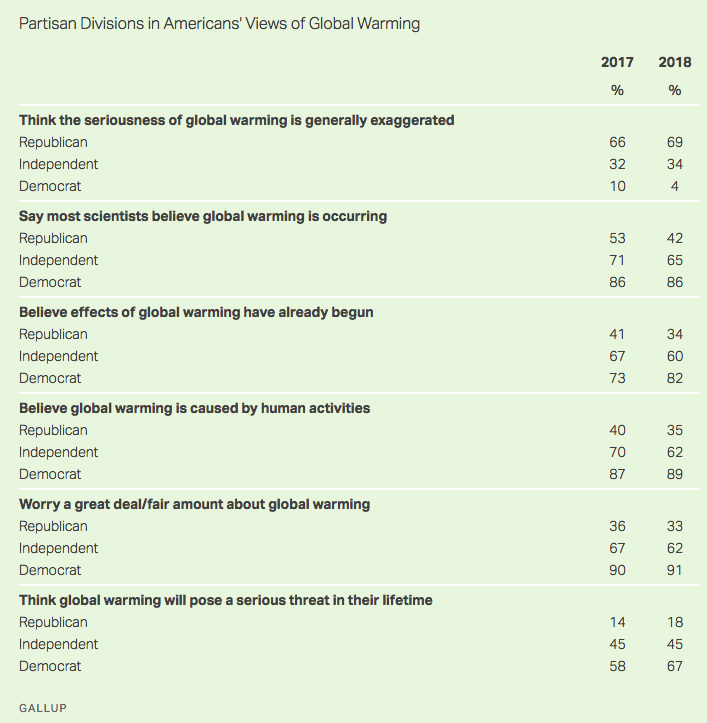 American conservatives are slightly more skeptical and less concerned about climate change issues compared to 2017, according to the poll. This boost in skepticism arguably stems from politicians' rhetoric. For instance, Trump recently suggested to 60 Minutes that humans might not be contributing to climate change. "I think something's happening," Trump said. "Something's changing and it'll change back again. I don't think it's a hoax, I think there's probably a difference. But I don't know that it's man-made." He added: "You'd have to show me the scientists because they have a very big political agenda." In October, a landmark report from the United Nations' Intergovernmental Panel on Climate Change found that the planet could warm by up to 2.7 degrees Fahrenheit by 2040 at the current rate of emissions. Avoiding such a change would require radical and unprecedented changes to the global economy, the authors wrote.